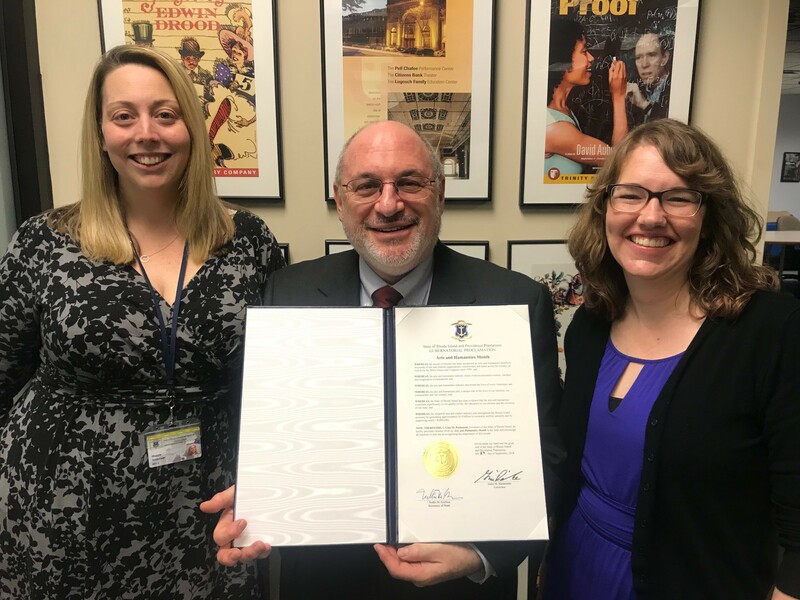 I am happy to announce that Governor Raimondo has declared October as Arts and Humanities Month in Rhode Island! We’re grateful to all of you – our artists & arts and culture organizations – for your important contribution to the cultural life of our State, and hope you’ll join us in a month-long social media celebration of the arts in Rhode Island. Here’s our plan: at some point in the month take a picture of yourself – or someone associated with your work – holding up a copy of the Proclamation (also attached at bottom of page) in front of some kind of arts making or arts learning. Post that picture on social media – Facebook, Twitter, or Instagram. Be sure to tag RISCA, and to use the hashtags #RIproclaimthearts #artistheanchor #NAHM. Also consider participating in the #showyourart2018 campaign on Facebook, Twitter, or Instagram. This is a social media campaign coordinated by American for the Arts that is designed to engage arts advocates on the local, state, and national level, and to bring awareness of National Arts and Humanities Month to the public. Check out some of the postings here, and then post your own stuff. This year’s campaign features a unique theme every day in October, including rural art, spoken word, arts & religion, dance, creativity at work, and more. Download the theme graphic here and share widely on the web and social media. Challenge yourself and your community to join in the fun using the hashtags #showyouart2018 #artistheanchor #NAHM. Finally, join us on October 26 for a closing event with Ruby Lopez Harper, Director of Local Arts Services at American for the Arts, and RISCA staff. Details to follow! So, October is the arts and culture’s chance to shine. Please consider being part of this month-long celebration!